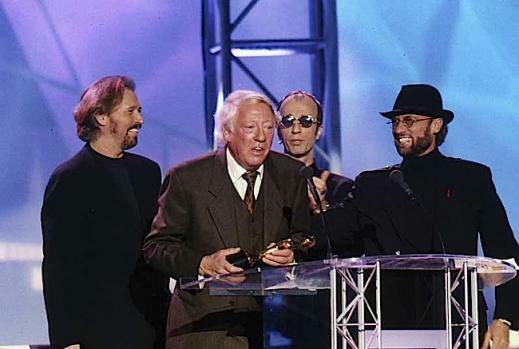 The Bee Gees with Robert Stigwood, Brit Awards, 1997. There are so many grand stories, some admittedly more myth than reality, about Robert Stigwood. The man who launched careers as stratospheric as Cream and the Bee Gees has died in England of a heart attack aged 81. As a manager, producer and one of the 20th century’s most brilliant music moguls, Stigwood was also responsible for bringing the stage musicals Hair and Jesus Christ Superstar to the masses, for turning Grease into movie and for converting a New York Magazine feature article into the era-defining Saturday Night Fever. As for his record label RSO, it’s arguable no music label has ever dominated the US top 10 like the Robert Stigwood Organisation did in the late 70s. In 1997 Barry, Robin and Maurice Gibb were marking 30 years of international fame with their best selling studio album since 1979, the five million selling Still Waters. They’d never given up. 30 years, then album sales of 120 million, songwriters of 21 different US or UK #1 hits, but a career that was never plain sailing. The masters of the comeback almost as much as the masters of melody, Stigwood’s presence alongside the three lads he’d nurtured back in 1967 was poignant. 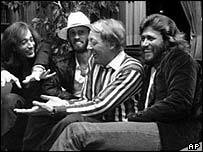 Robin, Maurice & Barry Gibb with Robert Stigwood, 1979. And I’m sure he believed it; he’d instantly signed the Bee Gees to a five-year deal said to be one of the biggest in the business for a new group ever – as much as US $50,000 just for the Atlantic distribution in the States – today worth over US $350,000. Millionaires before twins Robin and Maurice were out of their teens, the Bee Gees’ career was also in a precarious state as early as their mid-20s. The year was 1973 and six years after the initial contract, Stigwood rejected an entire Bee Gees LP as being too uncommercial, the heavily bootlegged and still-unreleased A Kick In The Head Is Worth Eight In The Pants. A shame – not least for the most spectacular album title that never was – but because the LP contained some works of real beauty, namely Elisa and King And Country, that rank amongst the brothers most beguiling early 70s songs. While still enormously popular in Australasia, South East Asia, Japan and Canada (a point almost always overlooked by biographers of the Bee Gees as well as the band themselves when negatively appraising their early 70s period), Robert Stigwood was right to give his boys a kick up the backside (if not the head or pants). A band who’d once been US and UK top 10 regulars had by 1974 gone two years without even a solitary top 40 hit in either of those territories. With the brothers pushed to relocate to Miami and write in a distinctively more commercial, R&B vein, Stigwood saw an opportunity to repeat his New York Mining Disaster trick again in 1975. Typecast as balladeers (paradoxically foreshadowing how one day they’d be typecast as “disco”), Stigwood sent the 45″ of funky new single Jive Talkin’ to radio stations in a plain white label. The song was irresistible, but would it have been played if DJs and programmers had known it was the Bee Gees? Proving the absurdity of radio programmers preferring image over output – an affliction that would reach its American Gibb nadir in 1987 when You Win Again hit UK #1 but only US #75 because of radio stations refusing to listen to it, let alone play it – the rest was soon multi-platinum history. Jive Talkin’ became the second of nine US Bee Gees chart-toppers for the decade (the most by any act) and as songwriters they placed a scarcely believable 13 songs at US #1 between 1975-79. The Bee Gees had parted ways with Stigwood by the time of the You Win Again comeback (the biggest hit in Europe for all of 1987) and there had even been a brief, bitter and long-since forgiven and forgotten exchange of lawsuits between the mentor and proteges in the early 80s. I often wish Stigwood had been around in ’87 to advise the issuing of the barnstorming You Win Again in a plain white label, completing the trifecta. “…and Robert, as the greatest showman in the world, if you don’t accept this award alongside us tonight then we will not accept it either. We love you, thank you.” Amen and RIP – that clip (also featuring Ben Elton and Sir Tim Rice) is below the song. Emotional article. Someone who knows well of the Bee Gees' trajectory.